This is a great opportunity for Modality Systems to grow into areas quicker and greater than ever before. If you want to read the full information around the acquisition goto https://www.modalitysystems.com/news/pgi-acquires-modality-systems. But, what does this mean for Modality the company and me/us the current employee’s. Well firstly for the company this is a massive opportunity to branch into areas with assistance of PGi for global reach and one in which we can almost triage the top major companies of the world on Unified Communications. Does this mean that Modality of old will change? Absolutely not !! in fact both Modality and PGi want to promote the Status Que and in truth why would you change a rockstar company? (If its not broken don’t fix it) as they say. It really is exciting times for me and all the employee’s at Modality with some nice planned changes already afoot in the coming months i.e. : New office location relocation in London, potential new office in the north of England, headcount doubling by the end of the year. I would like to congratulate Modality Systems and welcome PGi to what you will see is a brilliant company acquisition. Firstly I would like to say happy new year and welcome to my first review of 2015. This review in particular I’ve been looking forward to writing as its one I think changes the DECT headset market. As you will be aware I’ve reviewed other DECT headsets in the past including Sennheiser’s other offering the DW Office so when I got the D10 I did think why would Sennheiser bring another variant of the same type of device into the product line? Well be assured this isn’t another skew on the DW Office and is in fact a unique device in its own right. With all my reviews, my first point of call is ‘what is it to be benchmarked against’. To do this I looked at the headset features then tried matched them against the competitor’s offerings. Well this in itself became a small challenge as Logitech has the H8020 DECT headset which almost fits the bill. Plantronics doesn’t really have any desk type (Stand Based) DECT headset with the Savi Range being the closest solution. Then lastly Jabra was the nearest match with the Pro9xxx range of DECT headset but this is twice as expensive to buy. This got me thinking, has Sennheiser ‘backed’ the wrong horse in this race or was the other vendors behind the curve. Like other reviews I continue to bleat on about how none scientific approach to testing I do. (no I don’t have a sound booth, nor a room with formed triangles stuck to the walls). Instead my testing is one which a normal user would have at there disposal. eyes and ears. As usual I have split the review into the segments of benchmarking below, but for 2015 there is a new benchmarking test called ‘what lies within’. Firstly lets start off with the Audio Quality. As with what now is tradition with Sennheiser’s products both in the UC and Consumer markets, the Audio quality is exceptional with crystal clear HD sound for both inbound <listening> outbound <speaking>. What was interesting is the sound was that good on one call I could hear the callee breathing into their headset (it was another manufacturer headset which I wont comment on ) AND they said they wasn’t wearing it to close to their face/mouth. With the sound quality so good, it got me thinking, could I think of another headset which has better sound quality? Actually I can’t as the Senneheiser D10 is up there with the best in class. The D10 come with a sleek slim desktop charging stand which clip two parts together to my a kind of X shape bracket angle. The main part of the based unit is formed of black matt polyurethane, and the bracket arm is a block of milled aluminum. The base unit with the headset on stand takes up very little desk real estate and looks smart and welcoming. Having only USB charging is one of the differentiators between this and the Jabra 9xxx series as the Jarba DECT headset does require an external power source to charge the headset meaning another plug socket as well as a USB connection is needed. More on the charging time further down within my review. FINALLY, I thought we were never going to see a DECT headset with a base unit ring alert option made again. As a consultant this is one of the biggest bugbears of end users; not being able to hear the phone ringing. If this was manufactured 12 months ago, I could have literally sold 2500 of these to two customers. In the end they had to go with the Busylight options, which they still think, isn’t ideal. Like the DW office the D10 has the capability to allow upto 3 people to bridge into the call via the base unit. 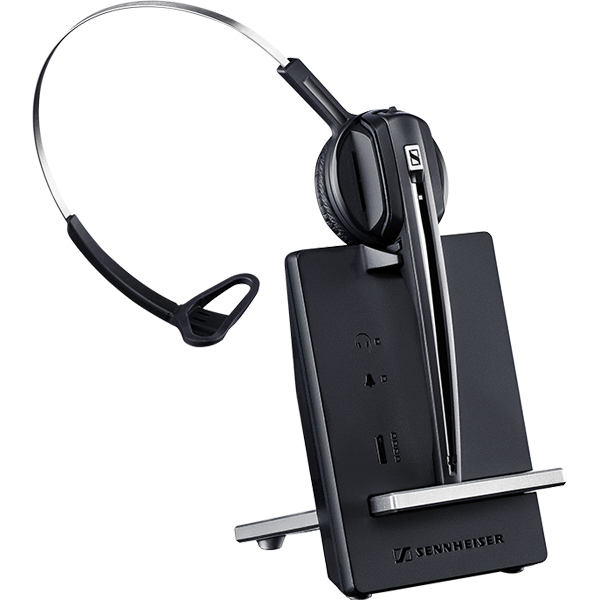 Again this is another perk of the Sennheiser range and one I know is a benefit within contact centre scenarios. 12 hours of talk time from a full charge AND without the requirement for socket power charging as all the charging is done via the USB connection. A power boost change 20mins gives the headset 3 hours of talk time in my test. Lastly a feature that Sennheiser calls Activegard? I had to look this up as it’s something new to me in the headset world. In short it means it protects the user from someone screaming/shouting or some other instant loud noise being sent down the headset. In truth this is something which I haven’t experienced as an issue before so I can really comment on if the headset does what it says. So to put a bit of meat around this new 2015 feature is to take apart the device to see how they have been manufactured. The reason for doing this is its ok on day one when you the customer receives your nice new shiny headset, but what is the affect 3 months down the road of daily use if the devices is poorly assembled at manufacturing. Its worth noting i will not embarrass manufactures with pictures (and believe me i could on many devices) on the innards of the device, but i will be clear on if i think the device will stand the test of time. RRP on one of these devices is £179.99, however you can get these for around £135.00 through distribution. Could Sennheiser make or made this device any better? I don’t actually think they could have made this much better as it’s one of the best devices for both build quality, sound, features and price I’ve ever used and tested. I can see this being one of the main product lines for Sennheiser in 2015. With my arm forced up my back (military style), my only enhancement which is not unique to the D10 or Sennheiser, but one of a general observation, is the fact we are coming into a stage in the headset cycle where these endpoints have to be diversely mobile. What I mean by this is we as users want the beauty of being able to roam to the far flung corners of the office while still connect via DECT to the call. Yet in the same breath, we also want the flexibility that we can if we want to walk with our laptop in hand and the device is clever enough to realise this a switch to using Bluetooth seamlessly instead OR if we was on a call at our desk have the ability to flip to the Bluetooth option and which was paired with our Mobile/Cell phone and for the call continue without a blip. OR another scenario would be if we was on a DECT call and we drifted out of range of the base station, the headset device was clever and it automatically transferred the call to you Mobile/Cell (again which was Bluetooth’d to the headset). ?not wanting much am i. What is the market place and which type of customer would this device be suited for? I personally wouldn’t ring fence this to a certain user group as I don’t see more of a benefit over another group or personnel department. That said in many call centre and administration type roles I can see this being a perfect winner. For example, how many times do you get a call via lync when you are writing or not paying attention and the computer your using doesn’t have a ‘ringer’ in the PC (now 99% of new desktops don’t have a internal sound/speaker)? Well with the D10 them days are gone as the base ringer now alerts you to the call. OR the base unit LED lighting provides awareness to the ringing call. Would I recommend it to customers? So were does that leave me with the D10? It’s fair to say this device now honors the primary place on my working office desk and now the go to device of choice. The DW Office has now been retired to my homelab. In terms of ‘lync star’ rating, what does this device deserve and why? For the features, sound and price point and market awareness, it s with pleasure and for the first every headset review I would like to award the Sennheiser D10 the full 5 stars. Simply put this is an excellent device and one I would highly recommend. Remaining vendors you are playing catch up. Recent and upcoming Google changes to the Chrome browser affect the Lync Web App on both Mac and Windows platforms, and require us to make changes to Lync Server and Lync Online in order to deliver a great experience for Chrome users. We have begun making these changes, and expect to complete them in the first quarter of 2015; in the meantime, when needed, we will provide users with manual work-around instructions as part of the meeting join experience. For Mac users: Google discontinued support in October for the 32 bit version of Chrome on Mac. Because the existing Lync Web App works only in the 32 bit version of Chrome, Mac users must for now use either Safari or Firefox to join a Lync meeting. When joining a Lync meeting, users with Chrome set as their default browser will see a message instructing them to copy the Lync meeting URL, open Safari or Firefox, and paste the meeting URL into the new browser window. The Lync meeting will then begin. We plan to remove this manual step for Chrome users by adding support for the 64 bit version of Chrome early in 2015. For Windows users: The most recent update to Lync Server 2013 (Cumulative Update 5.0.8308.857) provided manual work-around instructions to Windows users with the 32-bit version of Chrome set as their default browser, even though the 32-bit version of Chrome is still supported on Windows. On 12/31/2014, we released a new update to Lync Server 2013 (Cumulative Update 5.0.8308.866) to remove the manual work-around instructions and to allow the Lync Web App to run in Chrome as it did previously. We encourage administrators to apply Cumulative Update 5.0.8308.866 as soon as is practical to avoid the manual work-around. We have already begun applying this update to Lync Online. What’s next? As noted above, we plan to add support for 64 bit Chrome on Mac early this year. We are also working on solutions to minimize the impact on Chrome users with the planned deprecation of the so-called “Netscape Plug-In API”, or NPAPI, targeted by Google for April, 2015.